Spring.NET really has tons of handy features you can put to work in your application. One of them is its transaction management, that provides an implementation agnostic abstraction for your application. The first question you’re probably asking yourself is, why do you need to abstract away your transaction technology? The short answer is there are various ways of using transactions and different transaction technologies: ADO.NET, Enterprise Services, System.Transactions, and the different transaction implementations for other database technologies like ORMs (NHibernate). I won’t go into the detail of these, suffice to say that choosing, using and changing a transaction technology can become a complicated affair, and that Spring.NET protects your application from these ugly details. I encourage you to take a deep dive into the official Spring.NET documentation, should you want to know more about the details behind this. /// methods in a transaction. /// Executes the specified method in a transaction. /// Instantiates objects based on their name. /// Retrieves the object with the specified name. /// <typeparam name="T">The type of object to return. /// Retrieves the object of the specified type. /// Retrieves the object with the specified name, and constructor arguments. The Instantiate class is a wrapper for Spring.NET’s IApplicationContext, with a few helper methods. It provides three overloads of the method New<T>, that instantiates new objects from the ApplicationContext configuration. The most important method is New<T> without any arguments. This method simply grabs the first instance of the requested Type it finds in the ApplicationContext. The other two variations allow you to instantiate a new object with a specific id. With the help of the Instantiate class the Transaction class will obtain the specified transaction management from Spring’s ApplicationContext. 1. First get an instance of your chosen transaction implementation. 2. Call Execute with a delegate with an ITransactionStatus argument. 3. When you’re done, you have to return something, even if it’s null. Spring.Data.Core.TxScopeTransactionManager – local/distributed transaction manager from System.Transactions. Spring.Data.NHibernate.HibernateTransactionManager – local transaction manager for use with NHibernate or mixed ADO.NET/NHibernate data access operations. Spring.NET’ provides a TransactionTemplate that handles all the necessary transaction logic and resources like commits, rollbacks, and errors. It frees you from getting involved with low level transaction management details, and provides all transaction management out of the box. If you desire you can directly access a transaction manager, through an IPlatformTransactionManager interface, to manage the details of your transaction process. TransactionTemplate implements the ITransactionOperations interface. It has a constructor that requires a IPlatformTransactionManager instance. All transaction managers implement the IPlatformTransactionManager interface. This means TransactionTemplate contains the specified transaction manager. The required transaction manager is provided to the TransactionTemplate through autowiring of the constructor’s parameters. The autowiring searches through the objects and returns the first configured object that implements the IPlatformTransactionManager interface, which is transactionManager in our case. Object transactionManager is an instance of TxScopeTransactionManager, that is in turn based on System.Transactions. Transaction.Execute has a second optional parameter, commitChanges. The commitChanges argument defaults to true, so the transaction manager will always attempt to commit changes. I use it when I test my application, and I want all test data to be rolled back. Based on the fact that it commitChanges is an optional parameter, you’ve probably figured out by now that I recompiled Spring.NET to run on .NET 4. 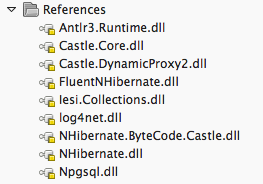 The example IFileTypeRepository is actually based on Entity Framework 4 with Plain Old CLR/C# Objects (POCO). Just in case you were wondering if Spring.NET’s transaction management works with Entity Framework. A very important factor to determine before writing any unit test, is what its scope should be. In other words a unit test should be written with clear objectives in mind, as to what it’s going to test, and anything outside this scope should be ignored as far as possible. This means that if we would like to verify business rules applied to data, then we should not test anything else. This includes the low level data access methods responsible for returning and transforming the data from the database. Mocks come in extremely handy in this scenario. They can be used to return generated data from my data access methods that reflect an ideal situation where result-sets are 100% correct. However this creates an overly artificial test setup, which completely ignores the role of data access methods. Mistakes in the underlaying queries also go unnoticed until its too late. Testing data access code, and including them in the scope of unit tests is a very cumbersome process. Hence I give them very low priority in my unit tests. Insert generated objects with the expected initial state. Fetch the inserted objects from the database, and execute business logic operations on them. Re-fetched them again, and delete the returned objects to clean-up the database. With this approach problems start when unit tests fail midway, and bits and pieces of the broken objects’ state remain scattered across the development database. Over time it gets messy, and often the broken data affects other queries and unit tests. This means that we lose the isolated characteristic of a good unit test, since one unit test can cause unwanted effects in other unit tests through the central database. Very bad indeed. MySQL is an excellent, very popular and open source database management system. A binary installation is available for Mac OS, and the process of installing MySQL on Mac OS is also very well documented. So just head over to MySQL.com, where you will find the binary installation, together with extensive installation, and usage documentation. To connect to MySQL from Python use MySQL for Python (MySQLdb). Get MySQLdb from http://sourceforge.net/projects/mysql-python/. Download MySQL from mysql.com and install the DBMS as instructed in the documentation. Either uninstall MySQL for Python if a setup program was used to install it, otherwise manually delete them. Download and unpack MySQL for Python. At the time of writing this is MySQL-python-1.2.1_p2.tar.gz . Open Terminal and change to the directory where MySQLdb was unpacked to. Get rid of any previous builds that might interfere, by deleting the “build” directory if it exists. Viola! MySQL for Python is all setup, and ready for your Python-MySQL data access code. Enjoy! OLE DB provider ‘SQLOLEDB’ reported an error. The provider did not give any information about the error. In SQL Server 2000 Enterprise Manager, expand the server node, then the security node. Right click on the “Linked Servers” node. Select the “New Linked Server… ” option to add a new linked server. Linked server: Type the logical name for the SQL Server that will be used in SQL queries. Other data source, Provider name: Select Microsoft OLE DB Provider for SQL Server. Data source: Network name of the SQL Server. Provider string: Can be left empty. Catalog: Database that will be connected to. Edit the Provider Options by clicking the “Provider Options…” button. Depending on your specific scenario, optionally uncheck “Index as access path”. After completing the above tasks you can continue setting the properties for the new linked server as you would under normal circumstances.